Last week I talked about the words “holiday” and “vacation”, and how they’re used differently. Today I’m going to talk about another way of saying that you don’t have to go to work or school by using the word “off”. For example, the school is closed tomorrow. 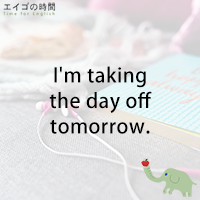 You have a day off tomorrow. Next week, you and your wife will be celebrating your 10th year together. So, you’ll take the day off. Let’s say, you need to go see a doctor tomorrow. So you’ll take the morning off. You’ve been busy and you really need some time off. You wish you could take the whole week off. If you don’t work on Saturdays and Sundays, that means you have weekends off. Personally I work freelance, so I can choose to take weekdays off instead of weekends. I’m taking the day off tomorrow. Next Post もう行くね。- I’m off now.